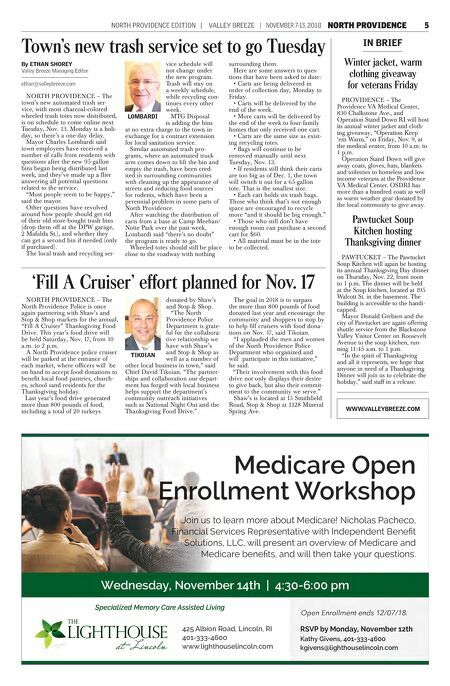 NORTH PROVIDENCE EDITION | VALLEY BREEZE | NOVEMBER 7-13, 2018 NORTH PROVIDENCE 5 NORTH PROVIDENCE – The town's new automated trash ser- vice, with most charcoal-colored wheeled trash totes now distributed, is on schedule to come online next Tuesday, Nov. 13. Monday is a holi- day, so there's a one-day delay. Mayor Charles Lombardi said town employees have received a number of calls from residents with questions after the new 95-gallon bins began being distributed last week, and they've made up a flier answering all potential questions related to the service. "Most people seem to be happy," said the mayor. Other questions have revolved around how people should get rid of their old store-bought trash bins (drop them off at the DPW garage, 2 Mafalda St.), and whether they can get a second bin if needed (only if purchased). The local trash and recycling ser- vice schedule will not change under the new program. Trash will stay on a weekly schedule, while recycling con- tinues every other week. MTG Disposal is adding the bins at no extra charge to the town in exchange for a contract extension for local sanitation service. Similar automated trash pro- grams, where an automated truck arm comes down to lift the bin and empty the trash, have been cred- ited in surrounding communities with cleaning up the appearance of streets and reducing food sources for rodents, which have been a perennial problem in some parts of North Providence. After watching the distribution of carts from a base at Camp Meehan/ Notte Park over the past week, Lombardi said "there's no doubt" the program is ready to go. Wheeled totes should still be place close to the roadway with nothing surrounding them. Here are some answers to ques- tions that have been asked to date: • Carts are being delivered in order of collection day, Monday to Friday. • Carts will be delivered by the end of the week. • More carts will be delivered by the end of the week to four-family homes that only received one cart. • Carts are the same size as exist- ing recycling totes. • Bags will continue to be removed manually until next Tuesday, Nov. 13. • If residents still think their carts are too big as of Dec. 1, the town will switch it out for a 65-gallon tote. That is the smallest size. • Each cart holds six trash bags. Those who think that's not enough space are encouraged to recycle more "and it should be big enough." • Those who still don't have enough room can purchase a second cart for $60. • All material must be in the tote to be collected. Town's new trash service set to go Tuesday By ETHAN SHOREY Valley Breeze Managing Editor ethan@valleybreeze.com 'Fill A Cruiser' effort planned for Nov. 17 NORTH PROVIDENCE – The North Providence Police is once again partnering with Shaw's and Stop & Shop markets for the annual, "Fill A Cruiser" Thanksgiving Food Drive. This year's food drive will be held Saturday, Nov. 17, from 10 a.m. to 2 p.m. A North Providence police cruiser will be parked at the entrance of each market, where officers will be on hand to accept food donations to benefit local food pantries, church- es, school sand residents for the Thanksgiving holiday. Last year's food drive generated more than 800 pounds of food, including a total of 20 turkeys donated by Shaw's and Stop & Shop. "The North Providence Police Department is grate- ful for the collabora- tive relationship we have with Shaw's and Stop & Shop as well as a number of other local business in town," said Chief David Tikoian. 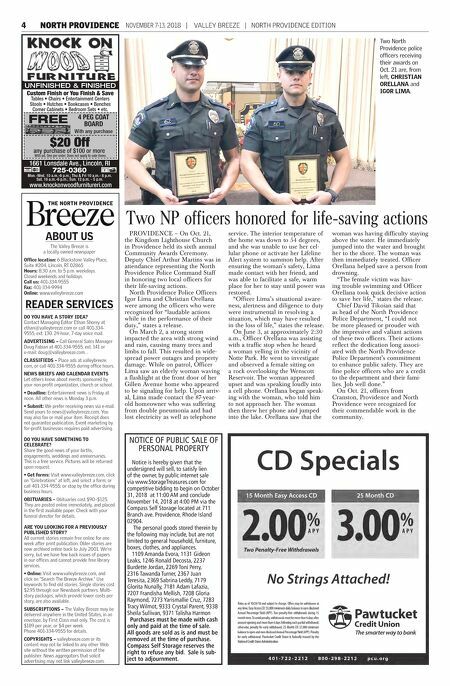 "The partner- ships and collaboration our depart- ment has forged with local business helps support the department's community outreach initiatives such as National Night Out and the Thanksgiving Food Drive." The goal in 2018 is to surpass the more than 800 pounds of food donated last year and encourage the community and shoppers to stop by to help fill cruisers with food dona- tions on Nov. 17, said Tikoian. "I applauded the men and women of the North Providence Police Department who organized and will participate in this initiative," he said. "Their involvement with this food drive not only displays their desire to give back, but also their commit- ment to the community we serve." Shaw's is located at 15 Smithfield Road, Stop & Shop at 1128 Mineral Spring Ave. TIKOIAN LOMBARDI IN BRIEF Winter jacket, warm clothing giveaway for veterans Friday PROVIDENCE – The Providence VA Medical Center, 830 Chalkstone Ave., and Operation Stand Down RI will host its annual winter jacket and cloth- ing giveaway, "Operation Keep 'em Warm," on Friday, Nov. 9, at the medical center, from 10 a.m. to 1 p.m. Operation Stand Down will give away coats, gloves, hats, blankets and toiletries to homeless and low income veterans at the Providence VA Medical Center. OSDRI has more than a hundred coats as well as warm weather gear donated by the local community to give away. Pawtucket Soup Kitchen hosting Thanksgiving dinner PAWTUCKET – The Pawtucket Soup Kitchen will again be hosting its annual Thanksgiving Day dinner on Thursday, Nov. 22, from noon to 1 p.m. The dinner will be held at the Soup kitchen, located at 195 Walcott St. in the basement. The building is accessible to the handi- capped. Mayor Donald Grebien and the city of Pawtucket are again offering shuttle service from the Blackstone Valley Visitor Center on Roosevelt Avenue to the soup kitchen, run- ning 11:45 a.m. to 1 p.m. "In the spirit of Thanksgiving and all it represents, we hope that anyone in need of a Thanksgiving Dinner will join us to celebrate the holiday," said staff in a release. WWW.VALLEYBREEZE.COM Open Enrollment ends 12/07/18.